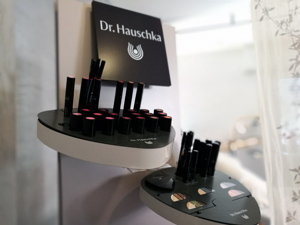 I have also extended my professional skills to include the field of beauty and am a consultant in 100% natural cosmetic products by Dr. Hauschka. A skin diagnosis can be made by advising you according to your needs and I can do your make-up. All products are made with bio-medicinal plants. Hair styling and a facial make-over go hand-in-hand, with particular attention given to enhancing inner beauty. Our hair reflects our health, our stress and emotions! To keep hair healthy and also for personal well-being, I perform cranial massages. 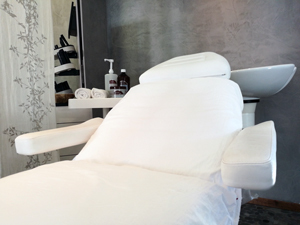 The purpose of a hair treatment is to revitalise you while enhancing the beauty of your hair. The purpose of the massage is to activate the blood's micro-circulation which leads to better oxygenation and improves the softness of the scalp. The combination of the two help you relax deeply, providing rest and well-being. These are not therapeutic treatments, but they are an opportunity for the customer to take a break, make time for themselves, and that's good for you!